See where everyone's getting work, how they bill, the big worries and other juicy insights into the working lives of others. Pursuing a career as an illustrator is the dream of plenty of creative freelancers. More often than not it's a chance to follow an artistic passion and to produce work that you're proud of. But what's life as an illustrator really like? To give you an idea, Ben the Illustrator has taken the industry's pulse with his Illustrator's Survey 2017. Having been self-employed in the creative sector for almost 20 years, Ben the Illustrator is in the perfect position to gauge the state of the industry. He's experienced all the ups and downs that the sector has to offer, so towards the end of 2017 he decided to get feedback from as many fellow illustrators as possible to see how their results tallied. And today he's announced that the results to the Illustrator's Survey 2017 are in. Exploring everything from how illustrators got into their line of work to how they promote themselves, the survey is a rigorous dissection of the issues surrounding creative freelancers. Beautifully brought to life by Ben the Illustrator with his signature illustration style, the results are a mixed bag of good and bad news. Starting with the positives, it looks like the work rate in 2017 looked healthy for the most part, with most work coming from publishing, editorial, art prints/exhibitions and advertising commissions. Interestingly, when you add the percentages of respondents who said they have creative and non-creative full-time jobs with an illustration sideline, you see that 44 per cent of professional illustrators are doing it in their spare time – almost as many as those working full-time. However, a majority of illustrators found that they weren't earning enough to live sustainably through their creative work alone – perhaps in part due to the fact that 71 per cent of commissions were paid late last year, making cash flows tight. 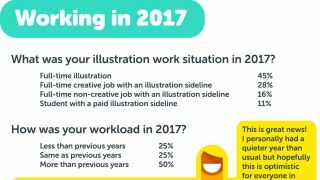 Another troubling statistic turfed up by the survey is that an overwhelming 79 per cent of illustrators feel that they have anxieties or confidence issues that affect their careers. Capping off the survey are some open questions that ask why illustrators decided to pursue their career, what they think could improve the industry as a whole, and what they think are the biggest concerns facing their business. Take a look at some of the statistics below, and be sure to head over to Ben the Illustrator's survey page to see the full set of results, alongside his helpful suggestions and comments.